It is well known that family meals are important and beneficial. But with new studies, family meals are becoming more recognized for their vital impact on children and the family. Family meals, in particular, have a major influence on children nutrition, education, and communication. According to Pediatrics 2011, children and adolescents who have family meals 3 or more times per week are more likely to have a normal weight and eat healthier than those who had less than 3 family meals. A Harvard study published in the March 2000 issue of Archives of Family Medicine showed that families that ate meals together every day or almost every day generally consumed higher amounts of important nutrients such as calcium, fiber, iron, vitamins B6 and B12, C, and E, and consumed less overall fat, compared to families who rarely ate meals together. According to a study done in Washington, DC, when the family turns off the television and shares a family meal, kids are more likely to eat more fruits and vegetables as well as eat less snack foods. Without media influence and distraction, the family can focus more on eating more healthfully. Children from families that watched more television ate more and less healthy food than did children from families that watched less. In addition, families that watched television while they ate meals ate more pizzas, snack foods, and soda than families that didn’t. Not only do family meals benefit kids nutritionally, but they also decrease the chance for them to use drugs and alcohol. A survey from the National Center on Addiction and Substance Abuse at Colombia (CASA) reports that the more often children eat with their parents, the less likely they are to smoke, drink, or use other drugs. A CASA national survey indicates that teens who have less than three family dinners per week are twice as likely to have used tobacco, twice as likely to have used alcohol, and one and a half times likelier to have used marijuana compared to teens who had five to seven family dinners per week. In addition to benefiting kids nutritionally and preventing them from doing drugs and alcohol, family meals give parents a chance to model healthy behavior, such as eating healthy foods and eating healthier portion sizes. Children often model their parents’ attitudes and habits, so dinnertime can be valuable in educating your children about healthy eating. In a focus-group study, adolescents believed that they would eat healthier if they were to eat more meals with the family. In addition, when asked if they would like their parents be a part of a health-promotion program, the adolescents stated that they would want their parents to learn how to make healthy meals. So if the kids more or less have an open mind about eating healthy, what’s stopping you from making it happen? Not only do family meals benefit the body, they benefit the mind too. A 1994 Lou Harris-Reader’s Digest national poll of high school seniors showed that students who ate more often with their families scored higher than those that did less. The National Center on Addiction and Substance Abuse reports that teens who have five to seven family dinners per week compared to those who have fewer than three received mostly As and Bs in school. In addition, researchers at the University of Illinois found that children ages 7 to 11 that spent a large amount of time eating meals with their families did well in school achievement tests. Preschoolers that ate more often with their family did better in language skills than those who didn’t as often; it is believed that it is at these meal times that give preschoolers more opportunity to hear and have conversations with their parents. Giving your kids a way to advance in their education is a great excuse for having more family meals together. With the hassles and stress of life, it’s good to sit down with the family to eat and talk together. 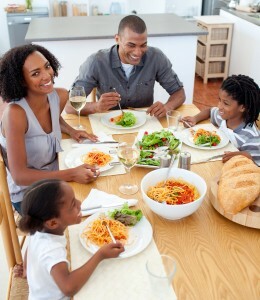 Family meals also increase family-connectedness and communication. Eating family dinners can help parents recognize early signs of eating disorders or any other issues; kids are more likely to share their problems with the family. Research has shown that family dinners discourage drug and alcohol use among adolescents, which is probably due to the increased communication between parent and child. This family time is beneficial as well for it can be time used to pass on cultural traditions and get to know one another better. This time allows parents to become closer to their children and according to CASA, teens who have five to seven family dinners per week are almost three times likelier to say they have excellent relationships with their parents compared to teens who have fewer than three family dinners per week. And it’s these excellent relationships that promote healthy habits for kids. According to that study, among the teens who don’t drink or use marijuana, those who have five to seven family dinners per week are more likely cite that their parents were the reason why. With all these benefits, it may be difficult to understand why we don’t have family meals more often. Why don’t we have family meals more often? In 2010, only 60% of teens reported having dinner with their families at least five times a week. When CASA asked teens and parents who have fewer than five family dinners per week, “What are some of the reasons you and your family do not have dinner together more often?” The main reasons include being too busy or being at work. Here’s a list of ways to save time for and make the best out of family meals. Family meals contribute a lot to helping the kids and bringing the family together. So no matter how busy you are, it is recommended that you try to organize more family meals during the week. In turn, you’ll find that your kids will eat healthier, be less likely to do drugs and alcohol, do better in school, and increase communication. Once you start spending more time eating together, you’ll understand what you have been missing, quality time with the family.